FECA has just expanded its product line to include the new Color Pop Series, a line of powerful and colorful Multi-Purpose Hooks that come in a variety of vibrant colors. These suction cup hooks encourage consumers from every age group to express their individual personality and creativity wherever they need a little organization. 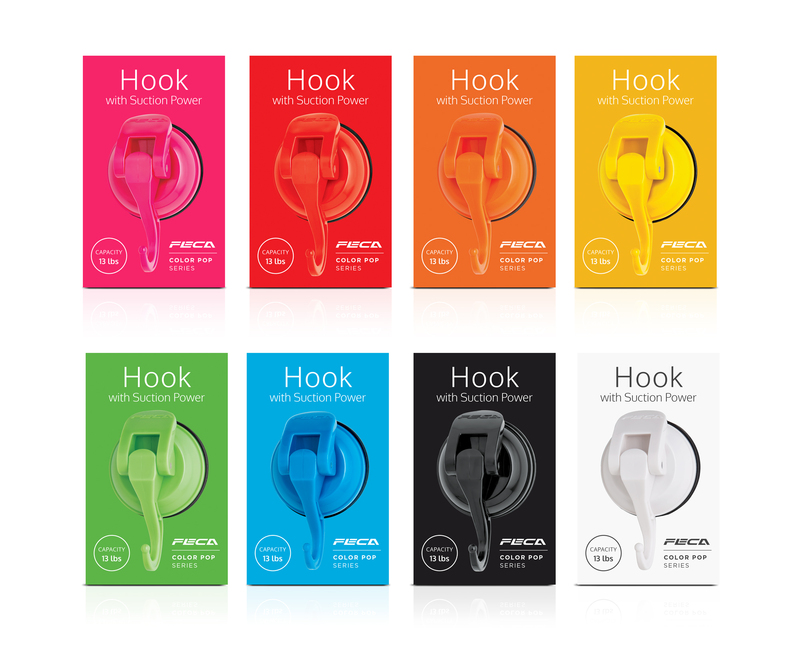 FECA’s new Color Pop Series hooks are portable, flexible and adjustable making them great for anyone and any place. What’s more, these Multi-Purpose Hooks feature FECA USA’s patented suction cup technology, allowing them to hold from 8 to 13 pounds and don’t require drilling or nails for installation—consumers just place the suction cup hooks where desired, push and lock in place. Colors include: Rose Bloom, Red, Orange, Yellow, Green, Blue, Black and White. MSRP: $7.99 (Medium), $9.99 (Large). Perfect for a multitude of tasks, these hooks are great for use in the home, gym, office, classroom, pool area and more. A must-have for home organization, these decorative wall hooks can hang anything from coats and purses to robes, backpacks and lunch bags. 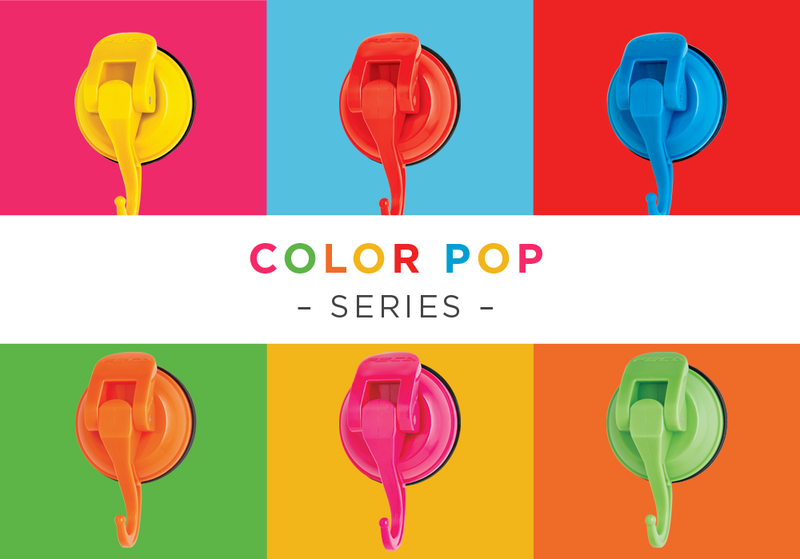 In addition, the Color Pop Series can be used as kitchen hooks to clear up counter clutter as well as bathroom towel hooks to ensure bathrooms stay clean and organized. For the fitness-minded consumer, these lightweight, portable hooks are great for organizing gym lockers, hanging towels in the shower or hanging yoga/gym bags in a fitness class. The bright colors of these suction cups with hooks allows consumers to distinguish their personal items among others, while the compact size allows for easy transport in bags and purses, ready to use anywhere consumers need an extra helping hand. FECA’s Color Pop Series of Multi-Purpose Hooks are available for purchase online at http://www.FECAUSA.com. FECA seeks to represent an organized lifestyle. With a combination of function and aesthetics, FECA is the solution for any modern home. The company manufactures a line of attractive suction cup products that in just a few steps allow homeowners to save space and reduce clutter. From the kitchen to the bathroom, from the great outdoors to the great indoors, FECA products like to stick around for a long time. For more information on the company, please visit http://www.fecausa.com.